An itinerary incorporating the scenic highlights of Peru. Private guided half day tour of Lima including Archaeological Museum. Private transfer to Lima airport for flight to Arequipa. Private transfer to La Hosteria. Private guided tour of Arequipa including Santa Catalina Convent. 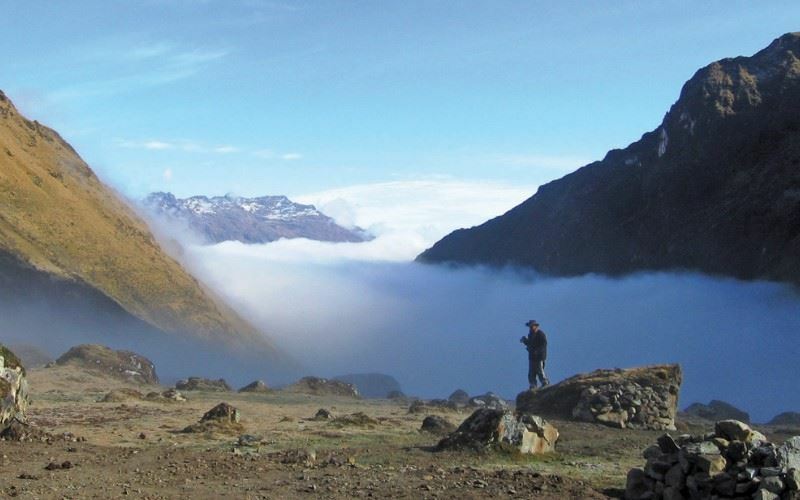 Cross the altiplano (to 4,800m) to Colca Valley stopping at places of interest. Private guided tour of the Colca valley including Colca Canyon and Mirador Cruz del Condors. Private transfer to Puno (approx 5 hours). Group boat transfer to Suasi Island via Uros Floating Islands and Taquile Island (approx 5 hours). Private guided half day tour of Cusco and local Inca sites including Sachyhuaman. Full day private guided tour to the Sacred Valley including Pisac market (main day Sunday), Maras and Moray. Private guided tour to Willoc Community and Ollantaytambo Inca fortress. Vistadome Train to Aguas Calientes (Machu Picchu Town). Check-in for 1 night stay on bed & breakfast. Private guided tour of Machu Picchu with minibus transfers and lunch. Second entry to Machu Picchu (no guide). Private transfer to Cusco airport for flight to Puerto Maldonado. Day 16 & 17 - Jungle excursions. Day 18 - Private transfer to Hotel Antigua Miraflores. Group transfer by motorised canoe to airport for flight to Lima. A charming, colonial mansion with 35 bedrooms offering a homely atmosphere. A charming, colonial mansion with 35 bedrooms offering a homely atmosphere. The hotel is located in the district of Miraflores with a variety of restaurants nearby. Standard rooms are spacious and attractively furnished. Some are colonial in design, housing original art and antiques, others are more contemporary. All rooms are en suite and provide telephone and cable TV. Some are suites which also include a Jacuzzi bath and a simple kitchenette for preparing light meals. The majority of rooms overlook the small courtyard in the centre of the property. Continental breakfast is served in the friendly restaurant which also offers a good choice of local traditional dishes for lunch and dinner. This hotel offers simple accommodation with an old-world charm. Right in the heart of Arequipa, La Hosteria is situated close to the many historical buildings, churches, the commercial area and restaurants. This simple but charming hotel has 11 rooms, equipped with minibar, cable TV and direct dial telephone. All have private facilities (bath and shower). Breakfast is served on the colourful terrace. A unique hotel set in the middle of the Colca Valley overlooking the Colca River. A unique hotel set in the middle of the Colca Valley overlooking the Colca River. There are 45 rooms, all with en suite facilities including family rooms and two suites. 25 are rustic style Andean rooms, the remainder are more contemporary. The rooms are equipped with bedspreads and blankets made from alpaca wool and most of the decorations are from natural materials. A heater is also provided for your comfort. From the restaurant there are panoramic views of the valley and mountains. The bar and relaxing lounge area have fireplaces and comfortable sofas. Possible outdoor activities include trout fishing, horseriding, local hikes and the hotels thermal pools. Positioned on the shores of Lake Titicaca this hotel has 45 rooms and 1 suite, all with private facilities (bath & shower), telephone, heater, hairdryer, safe box, cable TV & coffee making facilities. Positioned on the shores of Lake Titicaca this hotel has 45 rooms and 1 suite, all with private facilities (bath & shower), telephone, heater, hairdryer, safe box, cable TV & coffee making facilities. Lake view rooms can be pre booked and are recommended. Hotel facilities include: a gourmet restaurant; lobby bar, terrace with views to the lake, a private pier for lake excursions and a private train stop. A buffet breakfast is served every morning. Lunch and dinner is also available, served à la carte. Accessed by boat from Puno, this boutique ‘cottage style’ property is the only building on the privately owned 106-acre Suasi Island. Accessed by boat from Puno, this boutique ‘cottage style’ property is the only building on the privately owned 106-acre Suasi Island. The 24 spacious rooms offer spectacular lake views and are surrounded by lovely gardens. All meals are included and the attractive restaurant serves gourmet cuisine. The hotel offers an Andean sauna and massage room. Although the emphasis is on relaxation and tranquility, the energetic can take guided walks to the islands’ summit and kayak trips around the island are also available. This boutique style hotel is set in the historical artisans' quarter of San Blas, a pretty area of colonial style houses and cobbled streets, two and a half blocks uphill from the main square. Of the 18 rooms, 12 are standard doubles and twins with ensuite facilities, safe deposit box, cable TV and heater, and 6 are suites. 4 of these suites are on 2 levels with views to the city and a small kitchette, 1 is a junior suite also with a small kitchenette, and 1 is a senior suite with kitchenette, living room, jacuzzi and sauna. Some of the standard rooms have internal windows. A buffet breakfast is served in the small restaurant Tika, where lunch and dinner can also be taken a la carte. This hotel is located close to the town of Urubamba in a typically picturesque spot in the Sacred Valley. This hotel is located close to the town of Urubamba in a typically picturesque spot in the Sacred Valley. The 43 casitas have been built from local materials and are decorated in Andean style. From your casita you can admire the beautifully colourful flower-filled gardens. On property, there are cooking, weaving and pottery workshops, as well as traditional performances, season of theatre and contemporary circus performances to give guests a true flavour of the region. This lodge is located on the banks of Sandoval Lake and reaching the lodge is an experience in itself ! This lodge is located on the banks of Sandoval Lake and reaching the lodge is an experience in itself ! Upon arriving in Puerto Maldonado airport, there is a short drive to the Madre de Dios river followed by a 30 minute boat ride on the local motorised longboat to a point of entry on the riverbank which is a dirt track and can be muddy. It takes approximately one hour to walk inland (porters assist with luggage). From here all guests board a canoe and are expertly steered through a narrow canal before proceeding to the lake entrance and the lodge. The property is very rustic and basic, the rooms are small and have private facilities (shower only). Meals are quite simple and electricity is limited here. This lodge provides a very special experience and the wildlife is excellent - be prepared to be woken at 4:00am by the cries of the howler monkey!